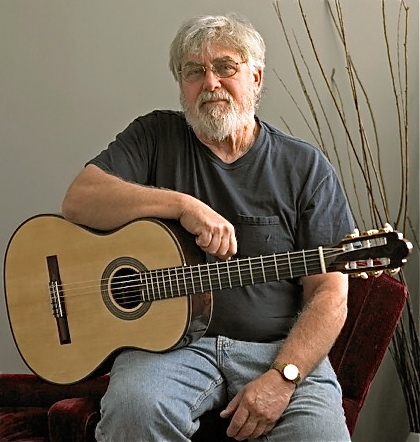 Beginning with Art Overholtzer’s “How To Build A Classical Guitar,” Randy built several guitars before beginning to develop his own design through experimentation. 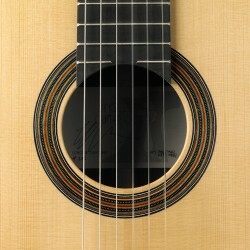 The influences of Craig Carter and Michael Lorimer helped Angella move in the direction of two luthiers he came to admire greatly: Hermann Hauser for their beauty and technical brilliance and Ignacio Fleta for their deeply expressive sound. Over the years, Angella has built guitars for many prominent players, including: Michael Lorimer, Eliot Fisk, David Tanenbaum, Manuel Barrueco and Jorge Caballero. The Angella guitar residing in our HGF Featured Luthier display cabinet at SFCM is made with 50 year old Brazillian Rosewood back and sides, a German spruce top and a string length of 650 mm. There are seven fan braces.